Home › entertainment › videos › Baby Bird Wants To Show Mom His New Talent. But When He Does THIS? I Can't Stop Laughing! Baby Bird Wants To Show Mom His New Talent. But When He Does THIS? I Can't Stop Laughing! Birds truly are incredible animals. Not only can a vast majority of them fly in the air, but they’re well known for their incredible intelligence and silly personalities. 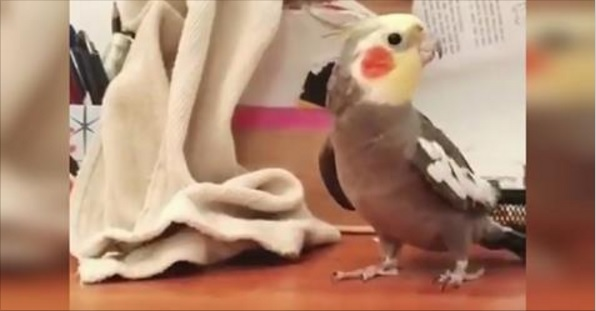 One such personality comes from a little cockatiel that loves to show off for his mom and the other birds in the family in the cutest way possible! Birds are famous for their skills in mimicry, but this bird really takes things to the next level. Whistling in perfect pitch the legendary Addams Family theme song, this bird has solved a problem that all birds deal with. The song, as we all remember, features the family snapping their fingers, and a bird’s claws aren’t exactly capable of snapping like that. So instead of using his talons, this smart guy raps his beak to the beat, and it sounds absolutely perfect! The second bird seems a bit jealous of his sibling’s talent, but that doesn’t stop the little guy from singing for the camera. It should also be noted that while it looks like he might hurt himself, a bird’s beak is quite strong. As anyone with a pet bird will know, when they are angry and don’t want to be picked up, they’ll be happy to show you just how strong their beaks are.